It’s considered one of the world’s most oldest and valued healing plants that dates back to the ancient Egyptians – but how is Chamomile tea good for you today? In this article, I will explore the brief history, nature and benefits of this popular herb that has earned the nickname “The All-Around Comforter”. The use of this plant can be traced back to the ancient Egyptians, who favoured it so immensely above all other herbs, that they dedicated it to their gods. The Anglo-Saxons called Chamomile Maythen and regarded it as one of the nine sacred herbs given to the world by the god Woden. The Greeks called it chamaimelon meaning ”ground apple” due to its apple-like scent and the Spaniards called it manzanilla meaning “little apple”. 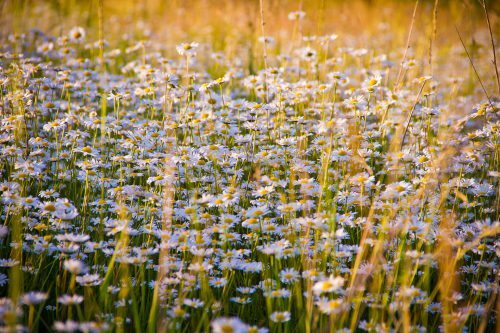 In the past, it gained notoriety as the “Plant’s Physician” meaning if other plants in the garden were looking weak and dreary, they would recover if Chamomile was planted near it! When walked on, it produces a strong and fragrant scent and for this reason it was used as an aromatic stewing herb during the Middle Ages. Due to its ground-covering ability in creating lawns, the plant inspired a proverb – “Like a Chamomile bed, the more it is trodden, the more it will spread”. The French treasure this herb as one of their six tisanes (herbal tea) due to its natural healing powers. 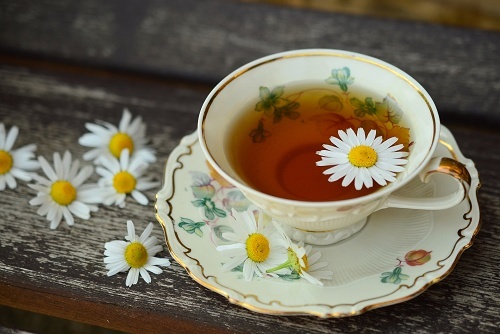 Chamomile has been found to contain fairly strong anti-inflammatory properties and is particularly effective in treating stomach and digestive problems such as menstrual cramps and Irritable Bowel Syndrome (IBS). Externally, it can be applied alone or with other herbs as a compress to relieve pain, swellings, inflammation and neuralgia. Those that suffer from arthritis may find this beneficial as it can reduce the stomach eroding effects of painkillers and other related drugs. 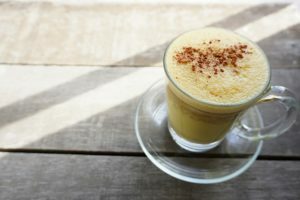 It contains anti-spasmodic properties which means it relaxes the smooth muscles in your body, including the digestive tract and uterus, to help ease a stomach-ache after a meal or help soothe the ‘time of the month’ cramps. It can be used to aid sleep, help combat insomnia and sleep disturbances and anxiety as it is a natural sedative. A chemical found in the plant called apigenin calms the central nervous system and can soothe frayed nerves before bedtime and make it easier to drift off to sleep. Due to its powerful, yet gentle, soothing and calming effects, it is one of the safest herbs used to soothe irritable babies and restless children and can help with teething pains, hyperactivity, earache and sleep problems. Historical fact – The plant was used as an effective remedy for treating hysterical and nervous conditions in women, including nightmares! Chamomile has strong antiseptic properties which makes it invaluable to treat burns, rashes, skin irritations, infections, heal minor wounds and reduce swelling in the form of an ointment. It can be used as a mouthwash for mouth inflammations, a gargle for sore throats and an eye bath for sore eyes. The plant has been used in cosmetic products such as skin cleansers, creams, lotions and soaps in order to regenerate tissue and to cleanse greasy and sensitive complexions. A regular soak in a bath with it helps to soften your skin and make you love the skin you’re in! Did I mention that the tea can also be used as a hair rinse to lighten blonde hair? Being dark haired myself, this doesn’t affect me – but all you blondies out there could save yourself a bit of money with your highlights! It helps to relieve gas and feelings of bloatedness and can aid in preventing diarrhoea and constipation due to its anti-spasmodic properties. 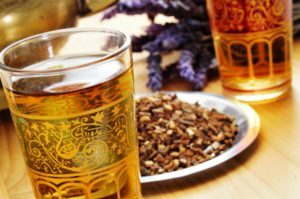 A cup of this herbal tea blend after a heavy meal or even a late night curry can help soothe that embarrassing trapped wind! 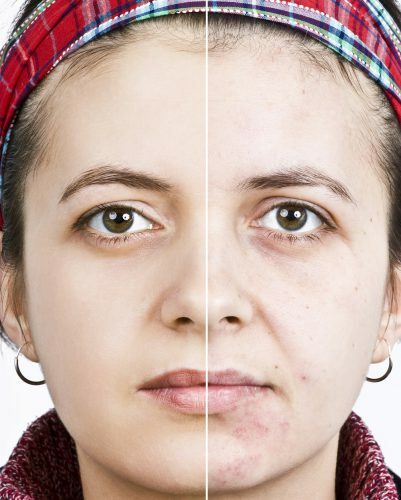 It seems this age old herb is still a favourite in treating certain ailments that still exists today and has also found a place within the beauty industry. No wonder the ancient Egyptians revered it! CAUTION: Chamomile is part of the Asteraceae plant family, which includes Ragweed, Asters and Chrysanthemum. If you are allergic to plants from this group, then it’s best to avoid using this. Do you drink Chamomile tea? Have you used Chamomile tea for any of the health benefits mentioned? Maybe you’ve used Chamomile tea for something else. I’d love to hear your thoughts and comments on this age-old favourite plant. Peace be with you. Chamomile is considered one of the world's most oldest and valued healing plants. Discover the health benefits and see how is Chamomile tea good for you. Thanks for this informative post. It was most timely since I am drinking a cup right now! Chamomile is a lovely tea for relaxing. My own preference is for the Mexican manzanilla. It’s a stronger taste than the European ones, but related, I think, and is truly lovely to smell as well. thanks for your comments. Chamomile is lovely to drink at any time of the day. I love to drink mine just before bed just so I can unwind. Yes they are related. The Greeks called it chamaimelon meaning “ground apple” due to its apple-like scent and the Spaniards called it manzanilla meaning “little apple”. Teresa, chamomile is my tea of choice just before going to bed. It always helps me sleep. It also seems to help with the frequent leg cramps I get. One way I do love chamomile is combined with other lawn plants. The combination of flowers and scents can be just incredible. I lay on it and watch the bees buzz merrily around. We are so lucky to have a reasonable number of bees left, so I like to encourage them. I do believe I am out of tea so it’s about to go on the next shopping list. so idyllic! I love Chamomile before I go to bed too and usually combine it with some Lemon Balm, Lavender and Catnip for a lovely concoction blend before bed. I’m glad it’s reminded you to get some more. I really like the ‘history’ of chamomile that you provided. It was cool reading it. I am a pharmacist by profession. I am one though, that believes in alternative medicine. I personally have found benefit in using chamomile and I have recommended to some of my patients. I believe that if we can help people without them having to experience nasty side effects, then we should do it. Oh yes, and one more thing I am more of a tea person than a ‘coffee’ person. Therefore, I will be following your blog. thanks so much for your positive comments and so great to know of what you do as a profession and your belief in the power of alternative medicine. The use of plants and its healing powers have been used for thousands of years and today’s science has been able to prove their health benefits that our ancestors have known back then. I love the fact that plants are making a comeback in improving our health and empowering us to make better choices about our health. I wanted to revisit your post to give you an update. I gave chamomile a second chance and find it’s really wonderful. Although the smell is not to my liking, I found the taste is really good. The best thing is that it did make me very relaxed and helped me get a good night’s sleep. I’m so appreciative that your post steered me back to this tried and true potion, one that is safe and is natural. That’s great news Lisa. So glad you found my post helpful! In a world full of hustle and bustle, we need anything natural to keep us relaxed and sane! Thanks for the update. Another great, informative article, Teresa. Great for nervous women and treating flatulence, eh? I”m gonna have to find me some of this stuff. Where am I most likely to find it? Hey Bill, you can get loose Chamomile from specialized herbal shops or online. Buying online offers better discounts especially when you buy in bulk. Take a look at my Shop-Loose Herbs to get an idea of how much you’ll be paying if you buy in bulk. Alternatively, Chamomile tea bags can be bought in any local supermarket. Happy hunting! Glad you found it useful Dominic! Thanks for reading. I’ll have to give chamomile another chance. It’s probably the one tea I do not like, but sure worth trying again. This time I’ll try to detect the apple smell and maybe that will help. Hey, if Peter Rabbit’s mom used it, then it must be good. 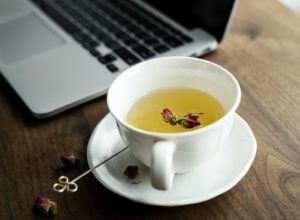 Chamomile isn’t as popular as it used to be so I’m trying to revive it – glad my blog has managed to convince you otherwise! Peter Rabbit’s mother used it huh, that’s interesting to know!